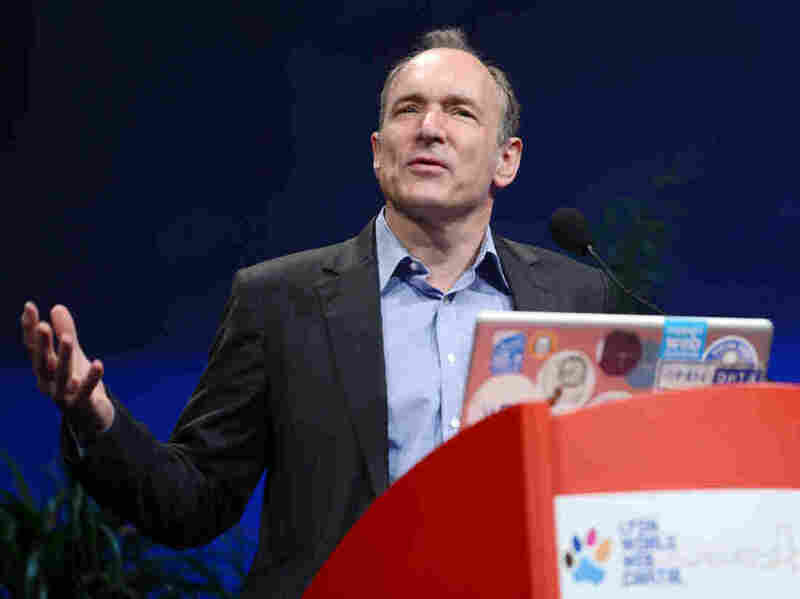 Tim Berners-Lee, The Father Of The Web, Is Worried About How Ugly It's Become : All Tech Considered When he invented the Web 28 years ago, Tim Berners-Lee saw it as a way to break apart silos and connect the world. Now he's increasingly troubled about its dark side, but he believes it can be fixed. Tim Berners-Lee still largely sees the potential of the Web, but it has not turned out to be the complete cyber Utopian dream he had hoped. Berners-Lee, a researcher at MIT's Computer Science and Artificial Intelligence Laboratory, spoke to WBUR about his world-changing technology and what the Web has evolved into over the years. Berners-Lee created the Web in 1989 as a way for researchers to share information with each other on the Internet. He conceived of the idea while he was working at the European Organization for Nuclear Research (better known as CERN). At that time, Berners-Lee says, scientists were using many different kinds of computers — Macs, PCs, minicomputers, etc. — and there was no way for these computers to talk to each other. "It was designed to be universal. The whole point was breaking apart silos," he says. He wanted to make communication easier. And he believed deeply in the power of a connected world to help us all work more efficiently and collaboratively across cultural boundaries. "The idea was that it could put anything on it. I never imagined that it would kind of have everything on it," Berners-Lee says. A side-note: Berners-Lee is also known to have introduced the first Web browser, the language for creating webpages (HTML) and essentially the algorithms that have allowed the Web to grow into what it is today. Berners-Lee initially imagined the Web as a beautiful platform that could help us overcome national and cultural boundaries. He envisioned it would break down silos, but many people today believe the Web has created silos. And he still largely sees the potential of the Web, but it has not turned out to be the complete cyber Utopian dream he had hoped. He's particularly worried about the dark side of social media — places where he says anonymity is being used by "misogynist bullies, by nasty people who just get a kick out of being nasty." Berners-Lee has been thinking a lot lately about the power of his invention and the Pandora's box it has opened. On the Web's most recent birthday (March 12), he wrote a sort of online manifesto that detailed three major challenges for the current state of the Web: personal data privacy, the spread of misinformation and the lack of transparency in online political advertising. "I spent the first 20 years of the Web telling people, just give everybody unfettered nondiscriminatory access to the internet. Let people build websites, let them link to each other. Good stuff will happen," Berners-Lee says. But now he's not as confident. In the last year, he's become increasingly worried about the Web's potential to live up to his vision as a tool for humanity. He insists he's still an optimist (in the long-term), in part because he thinks the Web will inevitably evolve. It's "crazy to imagine the Web will remain just as it is," he says. Berners-Lee says the people designing the current networks need to adjust their strategies, and have to rethink their roles and ensure they make online spaces into "places where nice things happen." But Berners-Lee doesn't believe the Web's current challenges can be fixed by tech experts alone. "It's only gonna happen because lots of people care about it very much, and it's not just people writing code; it's people writing laws, teachers, people in the street," he says.